The, "Fantasy Sports," series had a great first volume in which the protagonists faced off against an evil Mummy in a game of basketball. It was hilarious, well-illustrated, and all-around awesome. This second volume features our heroes having to come-up against the champions of a town in a game of volleyball in order to get-back some treasure they had stolen. It was fun, and keeping in mind how I adored the first volume of, "Fantasy Sports," I really enjoyed this entry as well, but two things made me like it just a little bit less than the debut book. First off, this entry ends with a huge cliffhanger discussing how our protagonists, Wiz and Mug, maybe should learn more about the organization they work for (e.g. they've probably been employees for the bad guys all along and not realized it). We don't see the proof of this though, as the book ends right as they set-off to learn whatever shocking truths we will probably see in the 3rd book. I understand a series wanting to leave us readers eager for more, but I just wish writer-artist Sam Bosma had given us a teeny-tiny bit more as opposed to having it feel like the story cuts-off right as things are getting especially interesting. The other issue I had with the book is purely personal in that I'm just not a big fan of Volleyball. I'm not a huge sports fan, but there are some I'm more likely to watch than others. Whereas I might enjoy a good game of Basketball, Hockey, or Football, I generally will pass on Golf, Volleyball, Baseball, and so forth. 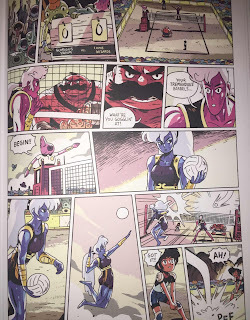 To the credit of Mr. Bosma however, he makes the game look exciting enough in the book that I still found myself intrigued by the match Wiz and Mug were playing. 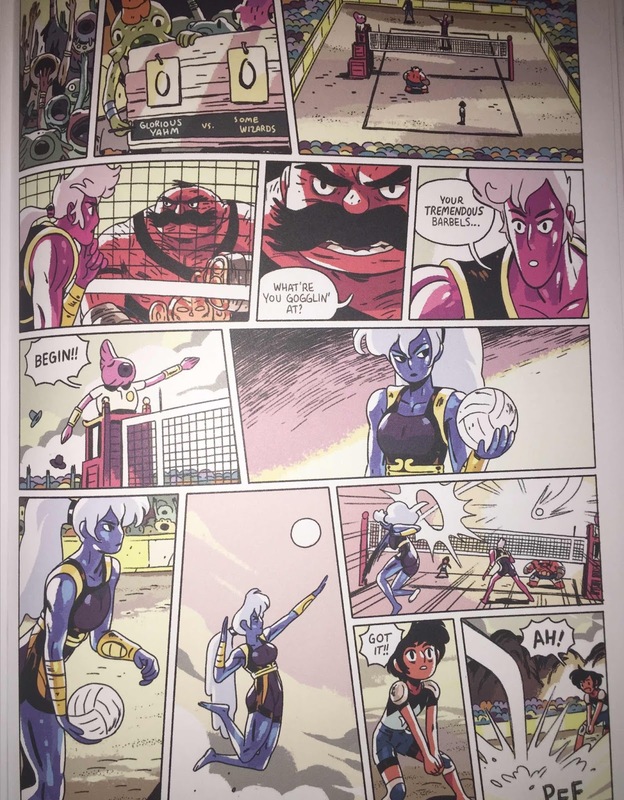 The artwork within, "Fantasy Sports," is just as good-looking as the first book, this time having a bit more of a blue-hue I would say, which is fitting as the volleyball game takes place on the beach in a town by the ocean. 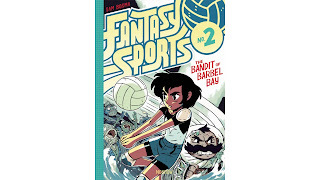 With the stellar artwork and a great story, "Fantasy Sports Volume 2" is a solid sequel to the splendid first book. While there are some complaints I had about this title I still overall had a great time reading the book, and without a doubt eagerly await the third volume so that the cliff-hanger which upset me so much can be resolved! We all know of Albert Einstein, but many of us admittedly don't know much about him. The book itself has a scene that opens with this, featuring various folk with an assortment of opinions saying things like, "The E=MC² guy, right?" This bit of the book itself expresses one complicated aspect of reviewing a biography. Namely, the first challenge is to see if the biography is about a person who led an interesting life, and the second challenge is to observe if the way their life story is told does justice to the person. Oh, and there is a third challenge too--if the book well done! Well, this book has the first challenge handily covered as Maier and Simon have a fascinating individual in the form of Albert Einstein who undoubtedly lived a fantastic life. The second challenge is well-met too, with the book giving us a solid look at Einstein from birth to death, using the technique of having Einstein himself narrate--almost as if this were an autobiography, but with Einstein as more of an omniscient narrator than just a human being--or as the book puts it when someone references his passing, "Albert Einstein is once again part of the cosmos." It's a strategy that pays off, as it allows the book to take comments Einstein made later in his life about the past, and insert them within events as they occur--almost as if he's there with us providing a footnote to a mistake he later regretted or idea he still couldn't believe he came-up with. The third challenge of the book needing to be interesting to actually, you know, read is undoubtedly met too. 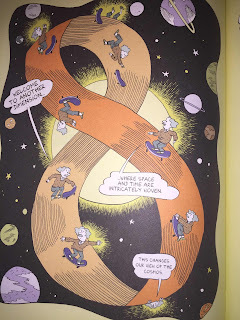 One thing I especially liked is how the book lays out the facts of Einstein's life in a clear design, using your standard panels, speech-bubbles, and narration. However, whenever one of Einstein's theories is discussed the pages suddenly break-out of the constraints of panels and spill across the whole space, covering the paper with surreal imagery, artistic designs, and clever visual metaphors. This style does a marvelous job of differentiating between the absolute facts of the life Einstein lived, and the world of questions and ideas his mind thrived in where anything was possible, be it a theory of relativity or all other kinds of incredible concepts. 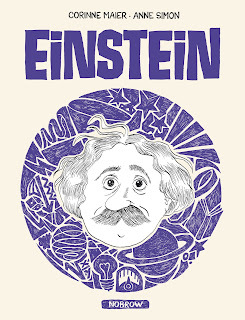 "Einstein," does a stellar job of informing readers about the famous physicist. 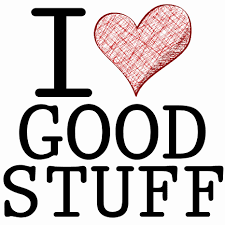 It shows wonderful things about the man but also doesn't ignore his flaws. It looks amazing--as I already said--and thoroughly fills us in about the life Einstein led. This books meets three challenges I think of when it comes to biographies with ease and skill, so I would say this is fantastic biography for sure. "Fantasy Sports Volume 2," and, "Einstein," both were great reads. While I found myself a bit perturbed by the cliffhanger at the end of this latest, "Fantasy Sports," and am not as intrigued by Volleyball it still was a fun book, and "Einstein," especially impressed me with its wonderful mix of story and surreal artwork. Nobrow continues to put out some superb books and I as always look forward to what they'll come out with next. Note: Copies of both books were provided for review.